The Achilles tendon is the largest and strongest tendon in the human body. As a result of its location and importance in ambulation, the tendon is associated with overuse type injuries. In a small number of Achilles tendon injuries, the acute tendonitis problem is not dealt with appropriately and the chronic microtrauma and damage to the tendon results in scar formation and bulbous partial tear damage to the Achilles tendon. This leads to chronic pain. This type of Achilles injury is chronic in nature and is referred to as an Achilles tendinosis. Achilles tendinosis type injuries are associated with a decrease in blood supply to the injury site, resulting in chronic and expanding scar tissue formation. The lack of blood supply to the injury site results in the body not responding to the injury and a chronic state of pain. In such cases, it is rare that rest, ice and anti-inflammation type activities will provide relief. Often, irritation of the tissue is necessary for breaking up scar tissue and increasing the blood supply for healing. The diagnosis of Achilles tendinosis is quite simple. Patients will often have a bulbous enlargement of the Achilles tendon in the central watershed region. The amount of damage varies but it usually affects somewhere from 20 to over 80 percent of the tendon. Although it is easy to diagnose a case of Achilles tendinosis, it is quite difficult to understand the presence or lack of blood supply to the area, and the amount of damaged tendon and scar formation. In order to provide proper treatment, it is important to understand the cause and amount of damage. In our institutes, we use color power Doppler ultrasound extensively in the diagnosis and follow-up of Achilles tendinosis cases. The power Doppler ultrasound allows us to check the amount of tendon damage by measuring the scar formation on a cross-sectional examination. One may also utilize the power Doppler to see the amount of blood supply to the region. The more blood supply in the region, the greater the chance you have of conservative care improving the underlying problem. Always attempt conservative measures prior to any form of surgical intervention. Conservative treatment ranges from simple to complex treatment options. If the Doppler exam shows decent blood supply to the Achilles, patients should rest and attempt physical therapy for at least one month to see if the Achilles will respond. Often patients may use a below the knee boot with a heel raise to rest the tendon. After a month, check the amount of scar tissue and blood supply with ultrasound to see how the tendon is responding. If there is progress, start conservative care with the addition of stretching and gentle strengthening. If there is a lack of blood supply and/or therapy is not helping, begin complex conservative care options. These are often procedures that stimulate the tendon and increase blood supply to the tendon. The three treatments that we recommend at our institutes are shockwave therapy, platelet rich plasma therapy (PRP) and Topaz micro-Achilles tenotomy (Arthrocare). All three treatments have a place in our toolbox. We usually use shockwave therapy in mild cases of Achilles tendinosis. We find that three treatments are necessary at two-week increments. The tendon experiences trauma at a microscopic level, which results in the breakup of scar tissue as well as increased inflammation and blood supply. In moderate to severe cases, we usually attempt PRP therapy. However, if there is severe scar tissue formation, these types of treatments may not work. Platelet rich plasma works to bring the healing growth factors associated with blood products to the area of scar tissue to fool the body into believing there is a local injury and sending more blood for healing. The additional needling during PRP injection also breaks up the scar formation in the Achilles and increases blood supply to the scar region. In cases of severe scar formation that is localized, one may attempt Topaz therapy. I prefer to perform a percutaneous approach rather than an open approach. I only perform an open Topaz procedure when I think the posterior Achilles retinaculum may be tight and I want to free it. Approximately 80 to 85 percent of Achilles tendinosis cases we see in our offices improve with conservative or complex conservative approaches. The other 15 to 20 percent will require more advanced surgical approaches. In such cases, one should map the affected region and amount of scar tissue with either ultrasound or magnetic resonance imaging. If there is greater than 40 percent tendon damage in a given region of Achilles tendon, attempts at simple scar tissue debridement and tendon repair have a lower rate of success. Remember, the tendon is coiled on itself and if you remove a large portion of the tendon during debridement, you will find weakness and even a non-functioning Achilles tendon. In cases of severe scar formation and greater than 40 percent tendon scar formation requiring debridement, I highly recommend a flexor hallucis longus tendon transfer to the calcaneus. This tendon transfer is so strong that it can act to replace the entire function of the Achilles. However, in tendinosis cases, one debrides the Achilles of all scar tissue and damaged tendon and performs the flexor tendon transfer to the calcaneus. In the old days, a large amount of flexor tendon was required for tendon transfer and this necessitated an incision in the arch for tendon harvest. With the advent of the Bio-Tenodesis Screw (Arthrex) fixation, one can harvest the flexor tendon from a posterior approach just deep to the Achilles tendon and transfer it to the calcaneus. The additional support and stability of a Bio-Tenodesis Screw also allows for a more rapid ambulatory program and early physical therapy. We have found that three weeks in a non-weightbearing cast followed by a plantarflexed position, short leg boot with partial weightbearing for an additional three weeks is ideal. Physical therapy starts four weeks after surgery and continues for two months. At six weeks, the patient may wear tennis shoes with a heel lift and progresses to full activity over the course of an additional six weeks. Be confident and aggressive with Achilles tendonitis and tendinosis cases. If a case of tendonitis presents, use anti-inflammation approaches and rest to calm the problem. Also consider identifying the underlying cause or mechanical stress resulting in the problem. If a tendinosis case is present, check the level of damage and the level of blood supply to the area, and treat accordingly. Increasing the blood supply and breaking up scar tissue will improve the problem in early cases but not in severe cases. If the scar tissue is not resolving, increase trauma in order to increase blood supply with shockwave, PRP or Topaz procedures. If a debridement is necessary, consider a flexor hallucis longus tendon transfer for additional strength and function. Dr. Baravarian is an Assistant Clinical Professor at the UCLA School of Medicine. He is the Chief of Foot and Ankle Surgery at the Santa Monica UCLA Medical Center and Orthopedic Hospital, and is the Director of the University Foot and Ankle Institute in Los Angeles. 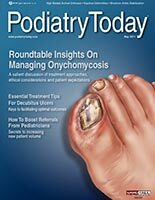 Read article on Podiatry Today.